East Central District Health Department (ECDHD) will hold the first area H1N1 student immunization clinic at Fullerton Public School on Nov. 5. An H1N1 immunization clinic will be scheduled at Boone Central Public School at a later date, according to Rebecca Rayman, executive director of ECDHD. The health department is not currently having clinics at larger schools due to a very limited supply of vaccine. ECDHD plans two other clinics at small schools in Platte County on Nov. 9, said Rayman. 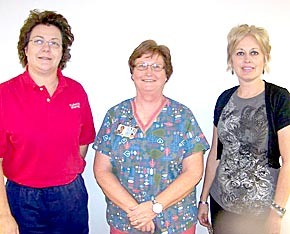 Registered Nurses Cindy Lesiak, LaVonne Carlson and Jeanne Temme of Boone County Health Center are the Immunization Team leaders for this area due to their experience in providing previous flu shot clinics in area schools. They will conduct the clinic at Fullerton. The Center for Disease Control allocates H1N1 vaccinations to each state, and the State of Nebraska divides their allocation based on population. ECDHD again tries to divide the vaccine based on the area population. “Out biggest allotment so far has been only 600 doses,” said Rayman last Friday. Health care providers have been administering the vaccine as it is received. In the last three weeks, Boone County Health Center has received only 173 doses of H1N1 vaccine. All of these have been administered to the priority groups identified by the Centers for Disease Control. More details in the Nov. 4 Albion News Print Edition.